Mon., Feb. 26, 2018, 6:04 p.m.
TAMPA, Fla. – Russell Wilson’s head knows football was the right choice. Baseball still has his heart. A 2014 Super Bowl champion quarterback with the Seattle Seahawks, the 29-year-old began a week of workouts Monday with the New York Yankees. 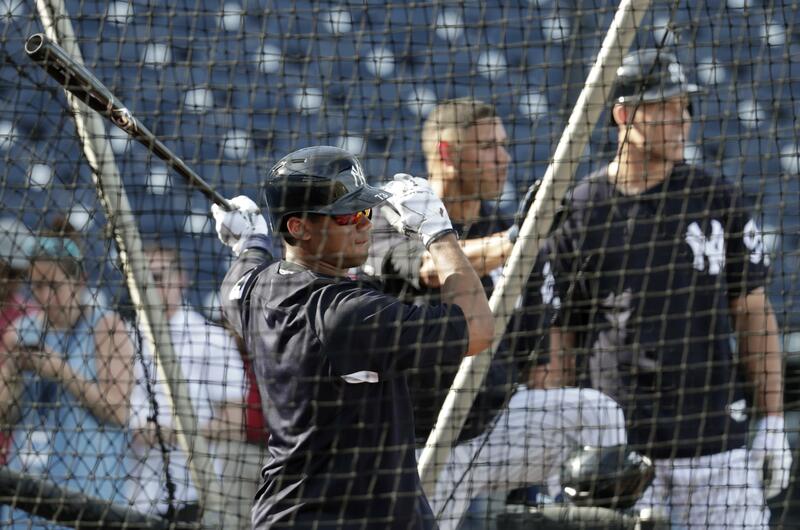 Wilson hit six homers in 39 swings as part of a batting practice group that included Aaron Judge and Giancarlo Stanton, the top sluggers in the major leagues last season, plus Gary Sanchez and Greg Bird. A middle infielder who hit .229 over 93 games at Class A in the Colorado Rockies’ system in 2011 and ’12, Wilson became the Seahawks’ starting quarterback in autumn 2012. He was selected by Texas in the 2013 winter meeting draft and attended spring training with the Rangers. Wilson was on vacation in the Bahamas early this month when he learned he had been acquired in a trade by the Yankees, his favorite team growing up. While the Yankees gave playing time to football players Deion Sanders and Drew Henson, they said Wilson will not appear in any spring training games; they want to observe his leadership skills, and he wants to soak up the attitude of a franchise with a record 27 World Series titles. “There’s an aroma around here that I’ve got to figure out, and I can’t wait to learn more about it and use that for my football career,” he said. Wearing pink sunglasses for BP, Wilson fell short of the fence in his first 17 swings with a 33 1/2-inch, 31-ounce personalized black Louisville Slugger. He then hit three in his next four tries, cleared the left-field walkway and clanked his final drive off the center-field batter’s eye. Wilson was on the field hours early, working with shortstop Didi Gregorius. He wand the Yankees were all smiles. “Watching him take a ball from the outfield that was kind of an in-between hop and watching him moving his feet real well and create a longer hop, that’s a savvy good-player move,” Yankees manager Aaron Boone said. Wilson spoke to the team before batting practice about leadership principles and said Judge and Stanton would be tight ends if they played in the NFL. He wore No. 73 – his football number, 3, is retired by the Yankees for Babe Ruth and his baseball number in high school was 7, retired by New York for Mickey Mantle. He said his great uncle wears a Yankees cap every day, even to Seahawks games. Wilson has no intention to switch sports. He doesn’t want to expand to a third sport and dabble with dribbling. Published: Feb. 26, 2018, 6:04 p.m.